Processing of the amyloid precursor protein (APP) by two different proteases, called alpha- and beta-secretase, is a central regulatory event in the generation of the amyloid beta peptide (Abeta), which has a key role in Alzheimer disease (AD) pathogenesis. TMEM59, a Golgi-localized protein, modulates the O-glycosylation and complex N-glycosylation steps occurring during the Golgi maturation of several proteins such as APP, BACE1, SEAP or PRNP. It inhibits APP transport and shedding. Sample (50 ug of whole cell lysate). A: mouse liver. 10% SDS PAGE. TA308979 diluted at 1:1000. 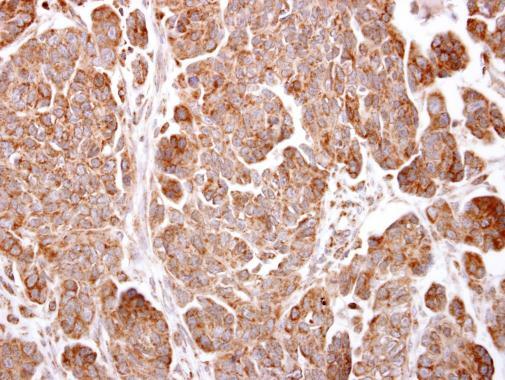 TMEM59 antibody detects TMEM59 protein at cytosol on human ovarian carcinoma by immunohistochemical analysis. Sample: Paraffin-embedded human ovarian carcinoma. 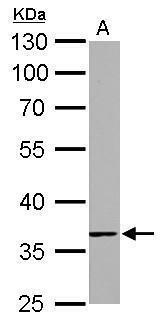 TMEM59 antibody (TA308979) dilution: 1:500. 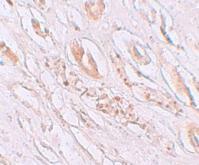 TMEM59 antibody detects TMEM59 protein at on mouse lung by immunohistochemical analysis. Sample: Paraffin-embedded mouse lung. 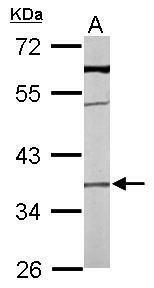 TMEM59 antibody (TA308979) dilution: 1:500. Western blot analysis of TMEM59 in human kidney tissue lysate with TMEM59 antibody at 1 ug/mL in (A) the absence and (B) the presence of blocking peptide. 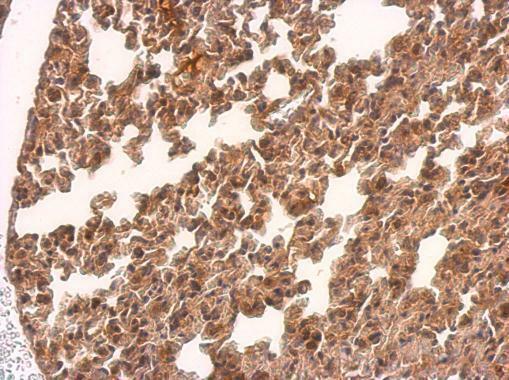 Immunohistochemistry of TMEM59 in human kidney tissue with TMEM59 antibody at 2.5 ug/mL. Immunofluorescence of TMEM59 in human kidney tissue with TMEM59 antibody at 20 ug/mL.